Despite the wet weather our pooch’s still need their daily walks. While they are enjoying themselves running through the puddles and mud we know what lays ahead when we get them home. Muddy floors, wet beds, and that distinctive wet dog smell for starters. Some owners may not have the facilities or the back to wash their muddy dog at home. That’s where we come in! 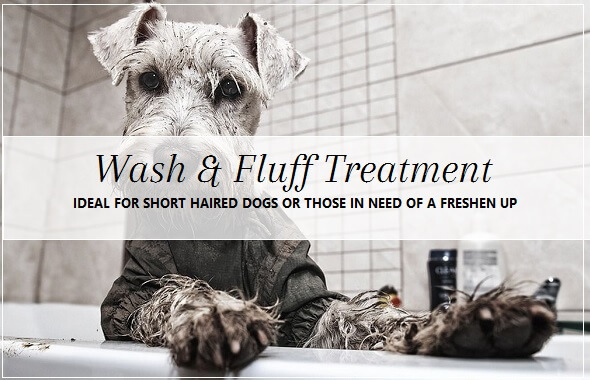 We offer a Wash & Fluff Treatment for dogs in need of a freshen up or as maintenance between haircuts. A Wash & Fluff takes between 1-2 hours depending on the size of your pooch. This all over treatment includes a super cleansing hydro-massage bath with aromatherapy shampoo, and aromatherapy conditioner to prevent your dog’s skin drying out and becoming itchy. A blow dry, full body brushing, trim of eyes, feet and private area (if needed), aromatherapy ear cleansing, and nail trim and file are also included for added measure. For dogs with facial folds such as Bulldogs, Pugs, and Shar Pei we include an antimicrobial treatment to remove tear stains and debris from deep facial folds. This treatment is priced per breed. Call us now on 01252 216 100 to book an appointment for your pooch. We would be delighted to serve your pet care needs.